Says Webber on the process of writing Aussie Grit his new book charting his incredible rise from a Queanbeyan boy to a Grand Prix winner, including a double win at Monaco, the crown jewel of F1. Written in the brash, honest and friendly style for which he is known you can certainly expect a few revelations in and out of the cockpit. After 12 years behind the wheel at Formula One, it’s no surprise the Australian, driving superstar has a few tales to tell about his time in the premier, racing league; starting out with Minardi in 2002 Webber soon had a reputation as being one of the most well liked drivers in the paddock, and his warm, Aussie charm delighted the media. In 2007 after stints at Jaguar and Williams he started getting real success. 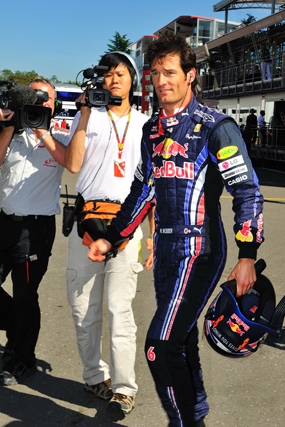 As part of the Red Bull team he achieved his first F1 win at the 2009 German Grand Prix. Whilst it was certainly a special and prosperous phase in his career their six year relationship eventually turned sour when tensions between himself and teammate Sebastian Vettel reached boiling point at the 2013 Malaysian grand Prix. Admitting he was more than ready for a new challenge, he now races for Porsche in the World Endurance Championship. Whilst not as high profile as the glamourous F1, the WEC has a far higher intensity. It makes 52 laps around Silverstone seem like child’s play. “There’s no dark horses, no smoke and mirrors. It’s just special people with a genuine passion for this beautiful hobby that they have. You don’t come across that in F1” says Webber. One of the highlights of the GT circuit is the legendary Le Mans. A 24-hour race which he describes as a “classic car race”. It’s something that he holds in high esteem, despite the frequent bad luck he has had on that track. This year’s event was no different for Webber, who looks back positively. ‘Aussie Grit’ by Mark Webber is out now in hardcover and E-Book format.